Looking for a nice hike that is not too difficult? 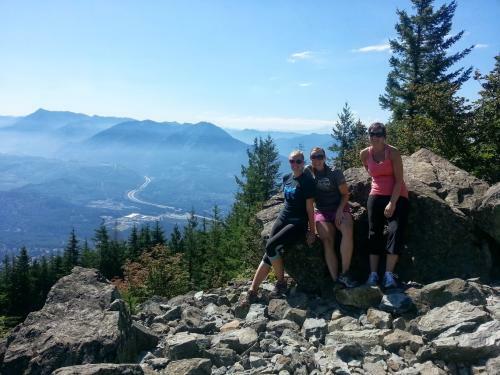 Try out Mount Si, located in North Bend, about 45 minutes northeast of Seattle Southside. Mount Si is part of the Cascade Mountain range and the climb to the top is 4,167 feet and 4 miles to the summit plateau. The vertical elevation change is about 3,700 feet. After exiting off I-90 my friends and I drove through North Bend enjoying the sights and the outlet mall, small shops and restaurants and the beautiful scenery. North Bend may look a little familiar as the television show "Twin Peaks" was filmed there in the 90s. Upon arriving, we parked in the Mount Si Natural Resources Conservation Area parking lot. Make sure you have a Discovery Pass to park so you don&apos;t get a ticket. The hike begins in a conifer forest and climbs to the site of an old burn where new trees are growing, There is a small stream and large rocks set along the walking path. About a mile in it starts to get steeper and there is a view point and then a resting point with benches to take a breather and a water break. After our short break we started up again and faced the switchbacks. 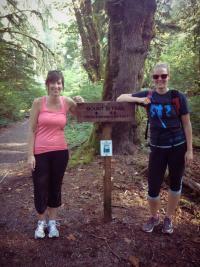 This a pretty popular trail so we encountered several friendly hikers of all levels. Some people use this a training hike, others are out for a leisurely stroll with their family. Once we were closer to the top, the descending hikers offered words of encouragement. It gets more rocky closer to the top and there are a few boulders to climb or hike around. At the plateau, there are several areas to sit and enjoy the view and a snack. 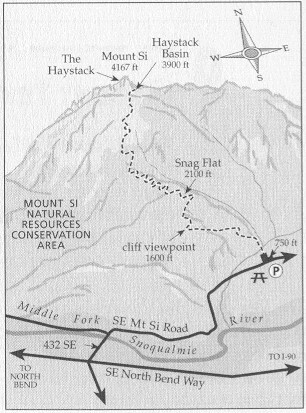 For the adventurous, the Haystack is a short scramble to the top and is considered a moderate class 2/3 climb. We sat in the sunshine and relaxed for a bit, taking in the expansive view, wildlife and some snacks. After posing for a few photos to document our accomplishment we headed back down the mountain offering our own encouragement to hikers on their way to the top. Since we had worked up such an appetite on the climb we stopped at North Bend Bar and Grill for burgers. This is a good ol&apos; home town restaurant with great food and a cozy atmosphere. There is even a fireplace with a huge couch to cozy up on in the colder months. After a celebratory cheers we started discussing plans for the next hike. Stay tuned!